This Upper Mustang Trekking leads you into the heart of the forbidden Kingdom: Lo Manthang. In fact, it used to be part of the Tibetan empire and is therefore closely tied to Tibet: You will experience Tibetan culture, language and geography. Enjoy Mustang’s rugged, mysterious, arid and haunting wilderness. Especially the wind eroded hills and cliffs make you feel like you’re in a lunar landscape. A Kingdom within a Kingdom, Mustang’s wealth was derived from its position on the Kali Gandaki – Thak Khola trade route to Tibet. Our Upper Mustang Tour begins in Kathmandu to get a first glimpse of Nepali history and culture. Further, the beautiful lakeside town of Pokhara waits for you to be explored. We then commence our trek to Jomsom (lower Mustang), passing along the banks of the Kali Gandaki River towards Kagbeni. On route to Lo Manthang in upper Mustang we pass through the extraordinary village of Tsarang. Noteworthy, this village is around 800 years old. Here, a set of human hands, said to belong to the site’s master builder, still remains. According to the legend, the king cut the builder’s hands off to prevent him from constructing any other place to rival it. Forbidden to foreigners until 1992, Mustang remains a controlled region which very few people visit, due a deliberate policy of cultural and environmental preservation. However, this is also why culture is so well-preserved in the former forbidden kingdom. Also, the unspoiled nature has not yet suffered from excessive tourist inflows unlike other areas. We will explore the exotic walled city of Lo Manthang, which is the former seat of the King. Discover the Kings Palace, surrounded by a maize of gompas and private houses all enshrined within the city boundary walls. Mustang appears to be one of the few places on earth that are frozen in time. Therefore, it remains one of the ultimate journeys ever to be made in one’s lifetime. The trek allows us to visit all the major villages on route so you’ll get first hand insights into Nepali/Tibetan culture. 09 Lo Manthang – Explore the Forbidden Kingdom of Mustang! Welcome to Nepal! A representative of Nature Trail will pick you up from the airport and bring you to the Hotel. Depending on the time of arrival, you have some time to explore the area around. Today you will explore Nepal’s capital and get to know the local culture and history some more. There are many interesting places to see in Kathmandu, including Durbar Square, Monkey Temple and the famous Boudhanath Stupa. 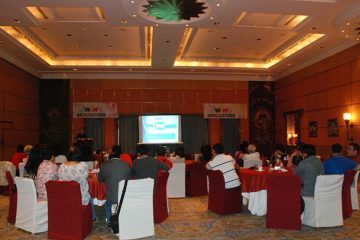 The program will be organized according to your personal preferences. Later, you will get to know your guide and discuss the trip details. This is also your chance to ask all the remaining questions you have. To get closer to the Mustang area, we need get to Pokhara first. You can take a flight for around 45 minutes from Kathmandu. However, considering that you will fly again tomorrow and already came to Kathmandu by plane, it is a good alternative to take the bus. On one hand, that causes less pollution to Nepal’s precious environment. On the other hand, the bus ride between Kathmandu and Pokhara is very scenic and enjoyed by many travelers. Along beautiful rivers, hills and villages, you will get a better image of Nepal’s landscape and culture. Let’s start the adventure with a short flight of about 25 min from Pokhara to Jomsom. 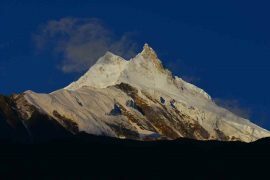 Enjoy the stunning views of the gorge between two huge mountains, Annapurna and Dhaulagiri. Jomsom is a large, bustling settlement and it’s the administrative centre to the region with airport, army camp, hotels, shops, banks and government offices. From here we start our trek by crossing the river to the eastern bank and follow the trail along the river to Kagbeni at 2,810m. Notably, this is at the northernmost part in direction to Mustang that can be visited without a special permit for the Mustang region. However, this village is fascinating with its rich Tibetan cultures and their unique hospitality which welcomes us greatly. Overnight stay at a hotel. From Kagbeni we start walking towards Mustangs capital, Lo Manthang, after our permits have been checked. Welcome to the Kingdom of Lo! The next few days we are slowly making our way up to Lo Manthang. The trail follows the ancient salt caravan route through which the people of Mustang traded Tibetan salt for grain from the lowlands. You cross pass after pass, which are all between 3500 and 4000m. and stay in beautifully remote, traditional villages. 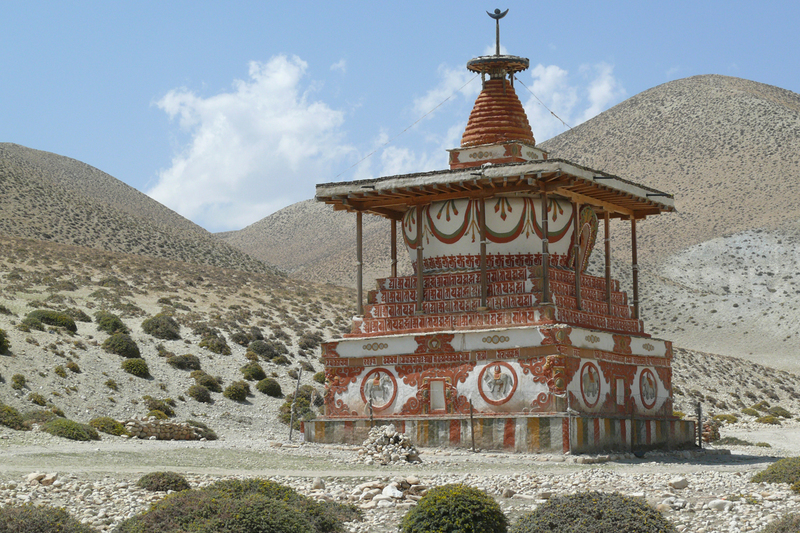 Lo Manthang - Explore the Forbidden Kingdom of Mustang! Welcome to Mustang’s capital Lo Manthang – the heart of the Upper Mustang region! This is a world of narrow alleyways, hidden stupas (chorten in Tibetan) and long walls of beautiful prayer wheels. You are free to decide what you like to explore today: Points of interest in Lo Manthang are the royal palace, a few beautiful monasteries like the Thugchen Gompa built in the 15th century. Or visit the amchi museum and amchi school. An amchi is a traditional Tibetan doctor. There are 2 amchis living in Lo Mangtang, which are also the official doctors of the king. They founded a school to preserve this ancient wisdom. 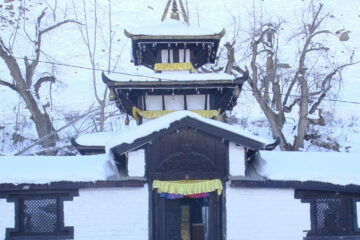 During the next few days we are going to make your way down again, so reach the famous monastery Muktinath. 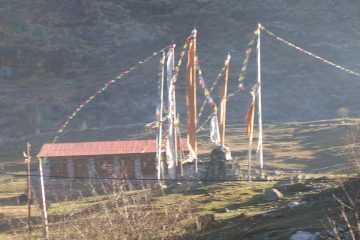 The barren landscape of our trail is dotted with settlements of white washed houses, barley fields and chortens festooned with prayer flags which add a splash of color to the landscape. Enjoy the scenery as we descend and notice how the landscape changes. After a holy night’s sleep we will leave Muktinath behind us and start to trek back on the trail via the Kali Gandaki valley. We arrive back in Jomsom, where we started our journey just 11 days ago… So much has happened since then! Good morning in the mountains one last time! Today, it is time to say goodbye to the mountains and board on the plane that brings you back to Pokhara. Don’t forget to look outside the window and enjoy the mountains as you fly over them. Welcome back in Pokhara! you can use the day for sightseeing, for example to Davis Falls, Gupteshwor Mahadev Cave, Shanti Stupa (World Peace Pagoda) or a boat ride on Fewa Lake. For the more adventurous, Pokhara offers also activities such as Bungee Jumping, Paragliding, etc. After a resting night at the hotel and a good breakfast, you will drive back to Kathmandu today, passing the beautiful mountains and rivers one more time along the way. In the evening we enjoy a farewell dinner together with Nature Trail staff, to hear all about your experience and reflect on your great adventure. Let us know when you depart and we arrange the airport transfer for you. 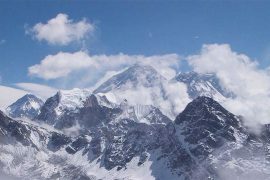 The regions isolation from the outside world has contributed to a highly preserved Tibetan culture and unspoiled nature. Mustang lies in the rain shadow of the Dhaulagiri massif creating a ruggedly arid land surrounded by rocks in all kind of colors and impressive formations. This barren landscape is dotted with settlements of white washed houses, barley fields and chortens festooned with prayer flags which add a splash of color to the landscape. Ready to get off the beaten path and discover the Himalayas’ Forbidden Kingdom?